Therrell Smith was born Nov. 5, 1917: She graduated from Fish University in Nashville in 1936 with a degree in sociology and then studied dance for 5 years at Carnei Hall. Her passion though was teaching ballet as a powerful means of self and group expression. What gave her life passion and meaning was a scholarship foundation she started aimed at helping black girls to grow strong physically and mentally, and to develop a positive self-image. 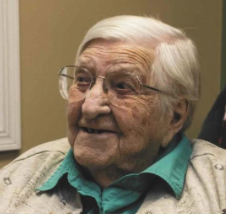 She had a deep appreciation for family and community. People describe her as: " very humble, very giving.” She always emphasized 3 things: a love for family, to seek wisdom and live life with enthusiasm. 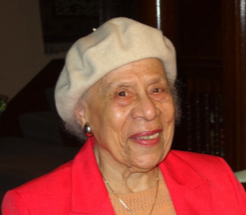 At 100 she’s still eagerly helping black girls overcome racism and sexism. And in this short description of her life are all the clues that 'the' longevity generator lies in her 'ways of being.' She lives a life of passion, purpose and meaning. She's contributing to the lives of others on an ongoing basis and feels valuable and that her contributions are valued. She lives a life of appreciation, enthusiasm and of service. And all these attitudes and beliefs lead to her cells living in a certain level of consciousness on an ongoing and patterned basis. And it's that consciousness that make her heart beat more coherently over her lifetime than incoherently. It's those ongoing habits of being ie. her consciousness that makes her immune system strong and so on. Hard work emerges from all the data as a 'way of being' for most centenarians.... they aren't slackers. But most importantly it's their attitudinal 'ways of being' towards work that makes the difference. Work is something they enjoy - and their cells which are eavesdropping on their thoughts know this and respond accordingly. She has a pattern of 92 years of faith. It's not just that she attends a church that is important (although this does have important social benefits that can add to longevity), it's that she has a belief system in a power greater than her. And it wasn't just that she was married for so long - it's that she perceived her relationship to be wonderful. Her cells and her entire body react to those perceptions in health and longevity-enhancing ways. What are the patterns of your consciousness that reverberate through your cells and are they health and longevity enhancing or eroding? Do you live more in fear consciousness or love? Do you live more in passion or purpose or boredom? Do you love what you do or hate what you do? You're literally creating your health and longevity moment by moment so it's up to you to make sure your consciousness is creating the biology that helps your health.